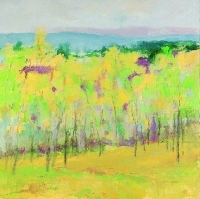 An accomplished plein air painter, Linda Arnold has had the opportunity to paint in many different locations around the United States, Europe, and South America, and she was chosen as the 2011 Andy Warhol Artist in Residence, an award given to an artist to pursue artistic endeavors at the Andy Warhol Preserve in Montauk, Long Island. Arnold has an active exhibition schedule and her work is held in many private and public collection in North America and Europe. In 2016, she had a solo exhibition at the Southern Alleghenies Museum of Art in Ligonier, Pennsylvania. Arnold currently lives and works in New York City. 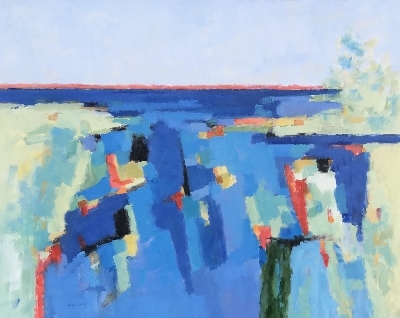 she keeps certain elements to ground her work, such as the horizon line, as she gives herself the freedom to push color and design. 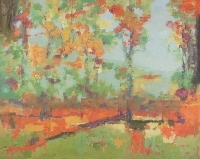 In this way, her landscapes can be read either as a perspective on the natural world or as a uniting of abstract forms.